In depicting time and places historians often argue pivotal roles of religion. Regions across the planet had been defined through advent and subsequent religious conquests. Religious (and ethnic) tensions remain omnipresent as religious unrest reverberates many parts of the world. As would politicians (like those currently vying for the US Republican presidential candidacy) campaign speeches testify, the importance of religion in politics of nations and on geopolitics continue to be significant. The Indian subcontinent – which was partitioned three ways in 1947 purely on religious majority of the respective regions – also has political forces, including the current Indian ruling party, that are capable to strike a religious chord with the electorate. Naturally, to those studying Bangladesh, an upsurge of enthusiasm to find the root and raise of its majority religion – Islam – is palpable, specially following a series of recent attacks claimed by Islamic terrorists. 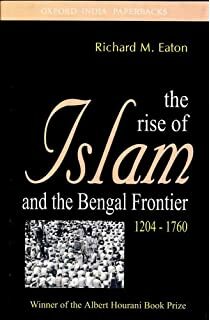 Two of our contributors reviewed a book published in 1993 by Richard M Eaton, which provided rich research on the topic: the rise of Islam in Bengal. The authors while recommended the book to anyone interested in Bengal and Bangladesh, reasons behind their suggestions are distinct. As would any two individual critiques they reflected diverse directives. Awrup Sanyal found the relevance of the book through an Indian perspective, where a lot of recent hubbub took place on Muslims, Islam, Bangladesh based Islamic terrorism and Hindutva ideologues. He also alerts readers to an inherent revisionist tendency that often hinder constructive discourse. Jyoti Rahman (as posted below), on the contrary, extrapolated some likely issues to which Bangladeshi readers may find the book useful. For example, the book would be useful to consider the ‘Bengali identity’ debate that often get many easily excited, or perhaps even more significant are the book’s posits to assess some of the contemporary issues – such as the relationship between Bangladesh and (North) India. Richard Eaton is a professor of history at the University f Arizona with research interests focus on the social and cultural history of pre-modern India (1000-1800), and especially on the range of historical interactions between Iran and India, and on Islam in South Asia. It’s been well over a quarter century that he did his research for the The Rise of Islam and the Bengal Frontier. Thanks for this – I am glad for the engagement but I wish there was a more detailed analysis and critique of the Eaton thesis by Jyoti Rahman. It appears it is left hanging in tantalizing manner at: “However, if Eaton is right, then we can bypass the identity debates altogether — Bengal delta became Bengali Muslim simultaneously, and only a few centuries ago, much like the settler countries of the New World.” So what are the implications of this conclusion?